Now I know we are not supposed to WASH disposable nappies, that’s sort of the whole reason they were invented, but one just snuck into my machine, and oh lordy. Please send help! Here’s what’s happened and why I am blaming my laundry faux pas on ‘mum robot malfunction’. When I opened the door of my machine this morning, with just five minutes to spare to hang out the ‘washed’ load before starting work, I was met with a sight. A sight that that would make any overworked mum (and who isn’t?) shudder. It had become so huge from absorbing all the water that it exploded! Little bits of whatever that ‘super absorbent’ chemical in the inner layer of nappies is, sprayed EVERYWHERE. And I mean everywhere. After picking out clothing item after clothing item, each coated in the slippery beads, I discovered my poor old my washing machine drum was slimier than wet play dough left out in the rain. Yuck. Now, I can deal with socks that mysteriously go missing each time I do the washing (I mean, that’s a given, right? ), and also tissue disasters that happen more regularly than I’d like to admit. But this? Well, this was the ultimate laundry mishap. The thing about a disposable nappy in the washing machine is that it not only wreaks havoc and is a pain to clean up, but it is also proof that you are a scatty mum. I mean, how the heck did I even do that? I think I know. The reason why a disposable nappy found its way into my machine and made a scene bigger than my little one melting down in Coles, is simply that I was trying to do too much at the same time. I was suffering from a condition that all mums have: multitasking overload. And as a result, I wasn’t thinking clearly this morning. In between getting my boys breakfast, I quickly scooped up the dirty clothes that needed washing, including a pair of cute penguin PJs my youngest had worn last night, that happened to still have his soggy nappy inside the legs. I had a toothbrush hanging out of my mouth as I shoved the clothes into the machine. After racing past my boys, stopping to squeeze A LITTLE honey on their Weet-Bix (because they can not be trusted to that themselves), to the bathroom to spit out the toothpaste and quickly tie my hair into a fashionable greasy mum bun, I was in ‘get everyone dressed and out the door’ STAT mode. As a result, my ‘doing it all at once’ mum robot suffered a little multitasking breakdown. And now I am cleaning up the mess. Pull out each jelly coated item and give it a good shake to remove the beads. Then put the entire load in the dryer so the beads get sucked up by the lint filter. Clean your washing machine drum by removing as many of the beads as you can. Then put some vinegar in the fabric softener drawer and run a cycle. 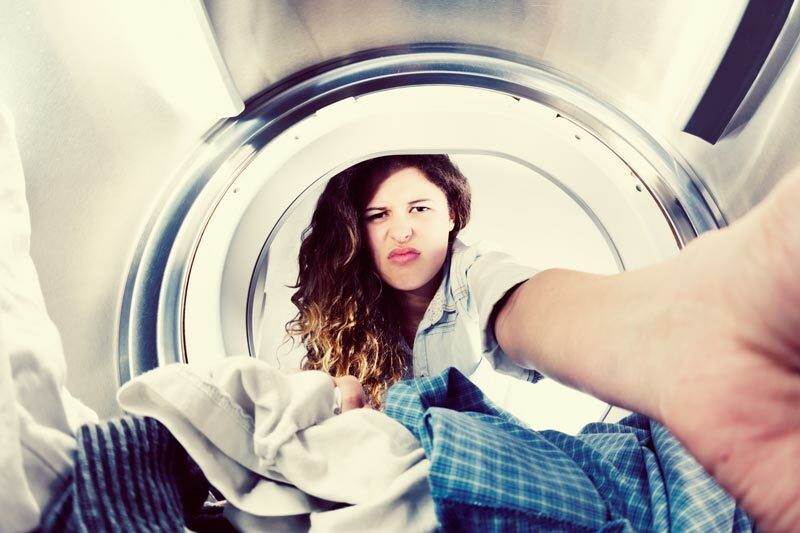 Wash clothes again in the clean machine if you wish and then do the vinegar trick again using a rinse cycle.